Note: The instructions below are for a self-hosted WordPress site, if you website is hosted on WordPress.com these steps will not work. First and foremost, you absolutely, positively need to backup your WordPress site. In fact – you should always back up your website regularly. Make sure you are using the latest version of WordPress. If the version you are using is not the most recent release, you will see a notice when you log in in to your dashboard that prompts you to update. If you don’t see a notice to update, you should be good to go! Browse through the plugins listed and click on details for more information about a specific plugin. 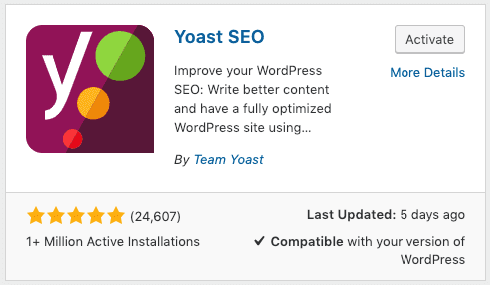 If the plugin you have selected is compatible with your current WordPress version, and looks like what you want, click Install. Once WordPress displays a message that it has successfully installed the plugin, click on Activate Plugin. This may take a moment to appear depending on the size of the plugin, speed of your connection, etc. Congratulations! Once the Plugin Activated notice is displayed, you have successfully installed the plugin and are ready to configure it’s settings. You should now see the plugin listed in the sidebar of your admin panel. If it does not show on it’s own, it may be listed under Tools or Settings. It is also important to note that since most plugins are third-party, it is possible that a plugin doesn’t work with the most recent version of WordPress or your specific theme. It is also possible that the plugin can make your site appear a little off. No need to worry if it does, typically just deactivating the plugin will get everything back to normal. Before installing any plugins, do a quick Google search and keep an eye out for other user’s issues. Use your best judgement and only download plugins with a proven track record (as made apparent by it’s rating) and that is being updated to be compatible with newer WordPress versions. If you have issues with a plugin crashing your site, simply navigate to the plugin folder through FTP (root folder > wp-content > plugins) and delete the folder of the plugin that you activated, causing your site to crash. This will deactivate the plugin and remove it – and the issues it caused.